I had the most wonderful opportunity to show off what we all do for a living during the last week of March. Hugh, a reporter living in England wanted to find out how we Americans did home care and health care in general and ended up visiting with us and some of our clients. Before he arrived, he had time in Washington and visited with NAHC members and had the opportunity to stop by the Supreme Court while the historical hearings on Healthcare Reform were ongoing. Having never paid a physician bill or an insurance premium, he had to have been bewildered at all the commotion. Upon arriving down south, he got to meet some of my colleagues, coworkers, and coworkers. Ray Banker, Demetrix Tolliver and Lorraine Wells all visited from local agencies. Jnon Griffin of Comfort Care in Alabama came to represent fans of the Red Tide. Poor dear. In case you think the South was overrepresented, keep in mind that Bobby Robertson from Healthcare First visited as well. His clients are spread out across the nation and he has unusually keen insights into our industry. Ray Banker of Audubon Home Health made a big deal about having tickets to the hospital’s annual fund raiser which was featuring the 80’s band, Foreigner as the entertainment. He pointed out several times that there were no remaining tickets left so even if we wanted to go, we would not be able. I enjoyed the picture of Hugh with the band at the hotel bar later that evening more than a well balanced person should. The fun part came later. Imagine if you were from another country where it is cold (by our standards) and rainy all the time. You fly into the states and hang out at the Supreme Court and NAHC and then arrive in the South and experience Southerners – US -for the first time. Imagine that you have never seen a bayou, eaten a crawfish, touched an alligator or met a Katrina survivor. Thanks to Tory at Bayou Health Care, that is exactly what happened on Thursday. That’s a pretty big day by any standards. The Katrina refugee was actually a patient with Medicare and one of those Medicare gold advantage plans. After falling off a ladder and breaking is pelvis, he was sent home at two am in what can only be described as frank, abject, maybe horrifying pain. Technically the pain only occurred when he moved but it was difficult to get him out of the car and into the bed without moving him. He is very lucky he is not married to me or he would still be in the car with his bottled water and his urinal. He was instructed to go to the MD within five days but couldn’t because his wife couldn’t handle the enormous task because of Multiple Sclerosis. Tori was working on it and a visit was scheduled to occur the day after we left – closer to 30 days after the fall. Then we saw the alligators. I thought they were so friendly because they were cold but maybe not. Our guest noticed bullet hole in the head of one which completely dispels my illusion that the gators just liked me. Doesn’t that say volumes about my assessment skills? Apparently there is a television show called Swamp People filmed in Pierre Part. We met several family members but ‘Troy’ was out getting some crawfish so we browsed the gas station in front of the Alligator fridge but none of us purchased a ‘Choot ‘em’ tee shirt. I feel sort of bad for the relatives of tourists bringing these home to family and friends in places where ‘Choot ‘em’ is not the phrase used to describe the act of discharging a weapon. They must think the Tee Shirts were discounted because of a screen print error. I don’t eat crawfish unless it comes with a cocktail made from benadryl, solumedrol and epineprine which wasn’t on the menu at Landry’s but Mandy is a pro at teaching others how to eat crawfish. We are currently applying for Continuing Education credit for the course but so far have had a lot of documents thrown back at us for ‘clarification’. See photo. How could anyone need further clarification. We stopped briefly at the Virgin Island – singular; not to be confused with the string of islands in the West Indies – to show Hugh snakes and turtles which are not common in England, apparently. He started getting a little anxious and wondered how he was going to explain away this 10 minute side trip as work. After I figured out that he was serious, I clued him in. This was home health. We don’t always stop to pet the gators but they were right there at the gas station anyway. Our Katrina victim and Medicare patient may have seen a bit extreme but all of our patients have unique histories and challenges. And in South Louisiana, there are only so many days when you actually want to get out of an air conditioned car so we took advantage after driving all day. So our reporter will have many political twists and turns that affect our industry and be able to write with confidence about the National Association as they rallied – yet again – for a targeted approach to fraud and abuse. The grandeur of the US Supreme Court in the midst of three days of historical hearings on health care reform is decidedly noteworthy. But down the bayou, (or in the high rise, the mountains or the inner city) is where the patients can be found and wherever there are patients, you will find good nurses. This is who we are – nurses taking care of people in their homes in the face of enormous challenges that have never been considered in Washington. Home health isn’t about politics or fraud and abuse. It is about finding a ride for a patient to get to the doctor. It’s about holding the hand of someone with a new diagnosis of cancer or trying to get the multi-pill jar patients seem to prefer sorted out. Its about teaching complicated medications to patients who really just want to get better and don’t care about anion gaps and insulin resistance. It is also about being a part of a community that may or may not include alligators and snakes, highrise buildings with unreliable elevators, icy mountain roads or too many narrow alleys roped off as crime scenes. Seems to me that if a reporter from another continent can take the time out of his life to ride down the bayou visit patients, so can the politicians and lobbyists who believe they know what is best for the Katrina refugee who relocated after the storm and can’t get to the doctor in this family oriented community where he has no family. I wish the Supreme Court Justices would ask Tory what she thinks of the individual mandate. And I am very open to taking Kathleen Sebelius for a ride down the Bayou. If anyone sees her, tell her to give me a call. Special thanks to my happiness engineer at WordPress. I tried to upgrade some services when my domain expired and what I wanted to do wasn’t possible. As it got later and later and my frustration grew, I emailed the support crew. Elizabeth, my happiness engineer didn’t just send me complicated instructions; she took care of the complicated domain mapping and such. I wish there were more happiness engineers in the world. Excellent Article…and you are very correct in saying that Kathleen Sebelius, the lobbyists and politicians should come to the “Bayou” to see what Home Care is really all about….obviously they don’t have a CLUE !!! Julianne, thank you so much for letting me come visit your two worlds: home healthcare and Southern Louisiana. It is obvious how much you care about both and I was bowled over by the friendliness and hospitality from everyone I met there. Thanks too to all the nurses, home health agencies and consultants who were so open with me and remain so hearteningly dedicated to their patients—regardless of the challenges they face. And thanks to to the patients who let me into their homes—that Southern hospitality thing is for real! 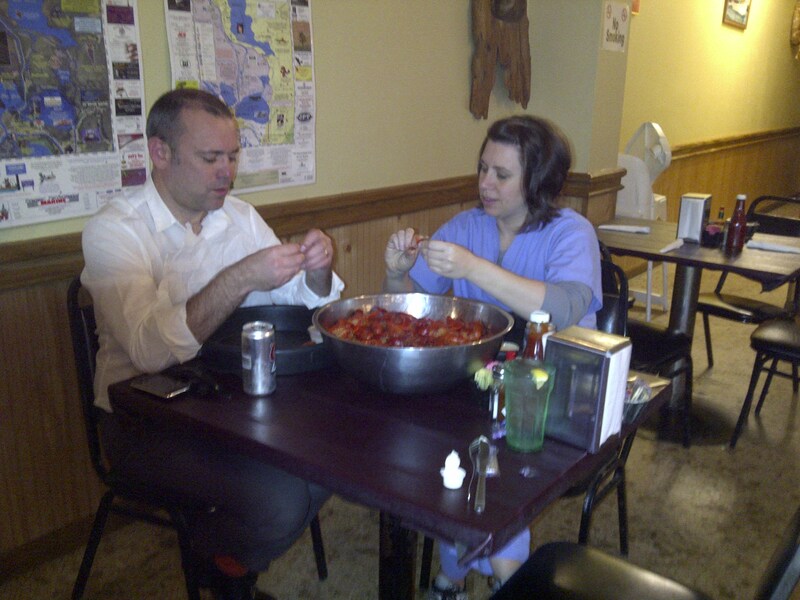 Lastly, thanks for all the crayfish, that 8lb bowl from Landry’s is still repeating.